Estonian cuisine has been formed and influenced by the various powers that have controlled its territory. The Scandinavian countries, Germany, Poland and Russia have all influenced what goes on the table in Estonia and its islands. 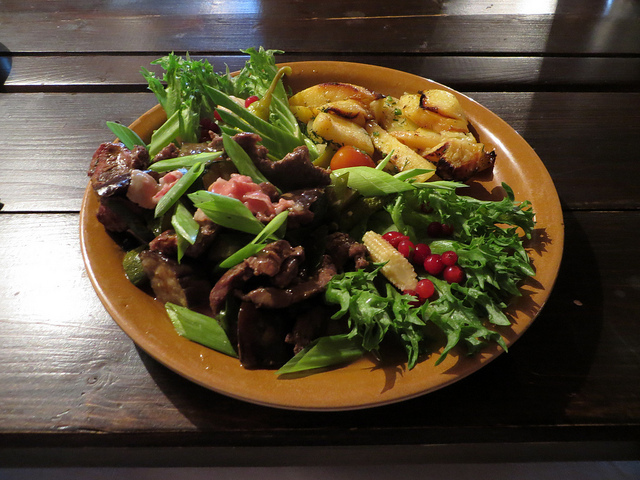 In Estonian cuisine, meat and potatoes dominate, but fish is very prevalent on the islands and coastal regions. Pork is the most common meat and one of the most popular main dishes is composed of pork, sauerkraut, apples, onions and barley. The Estonians use the whole animal and pigs ears and pigs blood are key ingredients in some of the most loved dishes. Blood sausages (Volgevorst) and jellied meat (Sült) are examples and can be found on tables in many Estonian homes and restaurants. Game meat is very popular and common and includes elk, deer, boar and even bear. The main course is always accompanied by Rye, or black bread. Estonians often use grains other than wheat for baking. 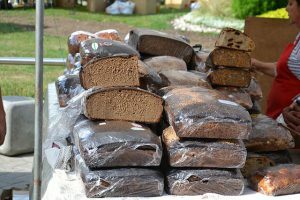 A uniquely Estonian food is kama, which is a mixture of roasted barley, rye, oat and pea flour. It can be made into a sort of mush and served at breakfast, but is commonly used in baking and sweet dessert dishes. Leivasupp is a sweet soup made out of black bread and apples. Baltic herring is considered the national fish and is eaten smoked or pickled. Sprats and marinated eel are likewise, very popular. Rosolje is a popular appetizer made with beetroot, potatoes and herring. Of course, fresh fish is also a major part of the diet on the islands, and is a livelihood for many. 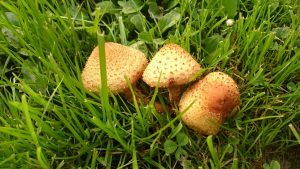 The forests and meadows of the islands yield numerous types of berries and mushrooms and foraging is a national pastime. Estonians are experts at preserving, salting, drying, fermenting and pickling all types of foods, thus preparing for long and cold winters. 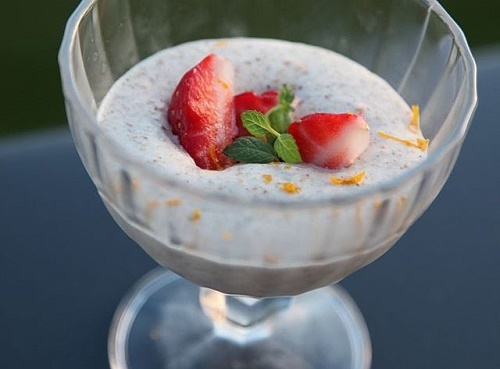 Popular desserts include kissell, a thickened and sweetened fruit or berry flavored dish that can be eaten hot or cold, or thinned and enjoyed as a beverage. Kringel, which is popular throughout Scandinavia, is also a common treat. It is a sweet bread flavored with cardamom. Kohuke are individually wrapped cheese curd snacks that are chocolate covered and come in various flavors. The country’s top chocolate producer is Kalev, which has a shop in Kuressaare. The island of Muhu is distinguished by Pädaste Manor’s Alexander Restaurant. One of the finest dining establishments in the country, it is known for using foraged local ingredients in it’s creative and elegant dishes. It is a definite must, if you are visiting the islands. The following video shows the creativity of the restaurant and includes foraging, fishing and some beautiful food. On Saaremaa, look for Saaremaa Kadakasiirup (juniper syrup), made with the addition of nuts, berries and spices, and which claims numerous health benefits. Hiiumaa is known for brewing beer. The Hiiu Brewery at Kassari Resort continues to produce tasty beer and also has beer making exhibits. Kali is a popular non alcoholic beverage that is said to be similar to root beer. Vana Tallinn is an Estonian liqueur distinguished by flavors of vanilla, spice and citrus. I have read somewhere that Estonians mostly just give it as a gift to visitors. 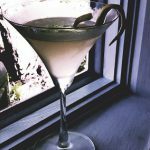 Although I don’t remember exactly how it tastes, I had it when I was in Estonia and have made it the inspiration for the Northern Spice Martini. Muddle cardamom pods with bitters, lemon juice and orgeat (almond syrup). Add vodka and shake with ice. Double strain into a small glass to strain out cardamom seeds and lemon. Then shake again with Goldschläger (which has little gold flakes in it!) and strain into a martini glass. Garnish with a lemon twist if desired.